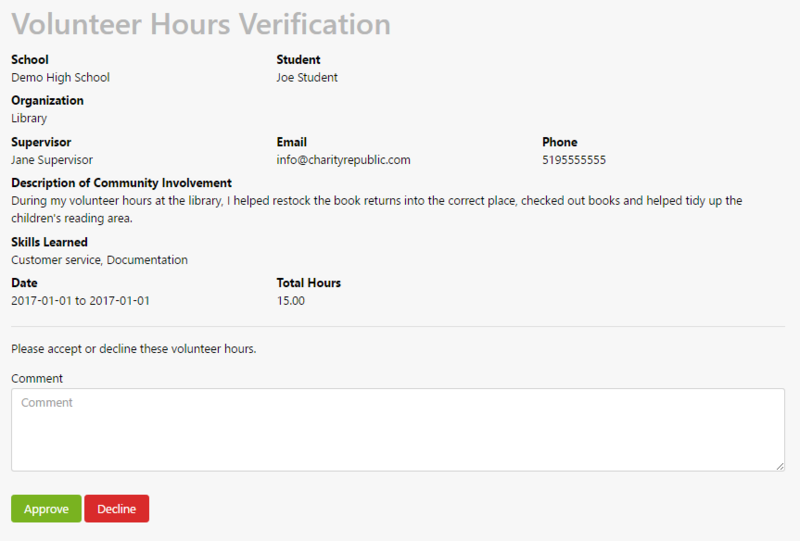 How do I delete or cancel pending hours that have already been submitted for verification? Pending hours can be cancelled and returned to a Draft state where they can be edited if necessary. Hours can also be deleted when they are in a Draft State. Why isn’t an organization receiving my email for the verification of hours? If the contact’s email has been inputted incorrectly (e.g. spelling errors), then the student’s submission will not go through. Please ensure that students are submitting their logs to the correct email address. NOTE: You can confirm a contact’s email via (i) Student Settings (e.g. Placement or Parent tab); (ii) Downloading and reviewing the Employer Report (Placement) or Detailed Hours Report (Volunteer); (iii) Reviewing an individual hour and activity log (Volunteer). Verification emails have not been received by a contact or organization Emails may not be received by the contact or organization as a result of their inbox being full or their email server being down. To check if this is the case, email the organization directly. If they are experiencing issues with their email, please call the organization to let them know. Verification emails have been sent to the spam or junk folders Emails from “noreply@charityrepublic.com” may be directed to spam or junk folders depending on the email firewall in use by a contact or organization. Please ask the contact to check their Spam and/or Junk folders and to add “noreply@charityrepublic.com” to a Safe List. They can also search their Inbox, searching “Hour Republic”, to locate the email message. Re-send the email to the Company or Contact If the company has not verified the hours after a long period of time, please have the student edit their pending hours and click to resend the verification email to the company or contact. Guidance can “Save and Approve” the Hours If a student cannot contact their organization and their hours are not being verified, guidance can manually save and approve of a student’s hours without verification from the organization. 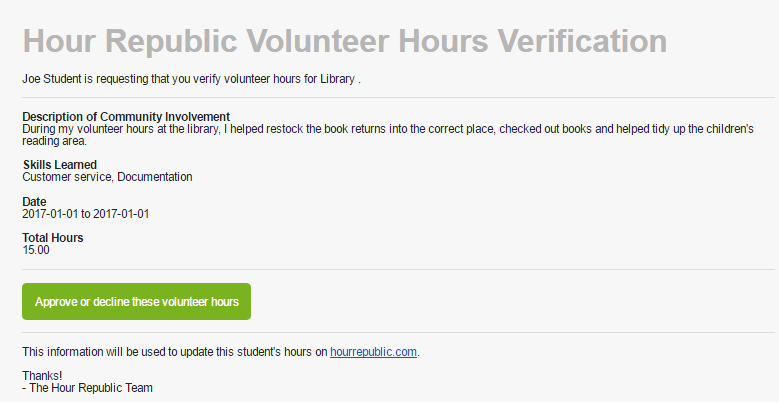 I understand that you are not receiving verification emails from Hour Republic. Sometimes, emails from Hour Republic (noreply@charityrepublic.com) may be directed to your Spam or Junk folders depending on the email firewall in use by your organization. Please check your Spam and/or Junk folders to locate the message. If you are still unable to locate the email message, then please search your Inbox, searching for “Hour Republic”, to locate the message. Finally, you can add “noreply@charityrepublic.com” to a Safe List. This can usually be done directly in your email account, or via your IT department.